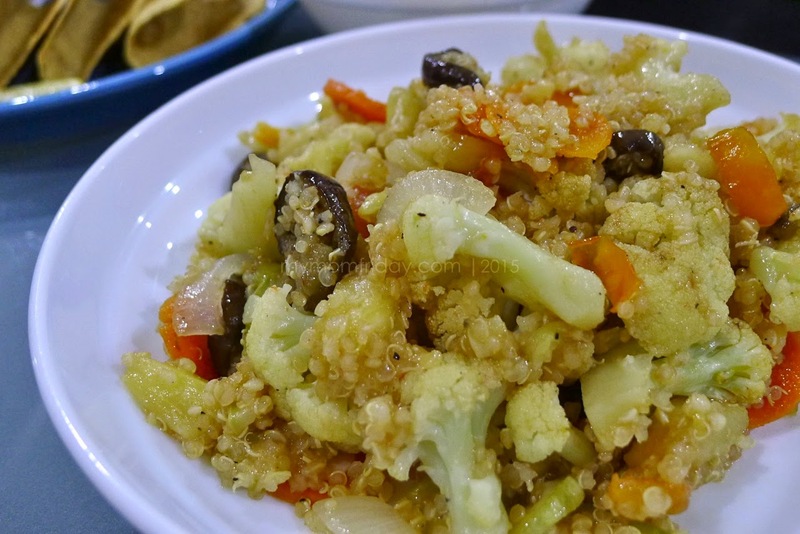 My Mom-Friday: Quinoa with Roasted Vegetables and Pineapples + Doleicious Giveaway! Quinoa with Roasted Vegetables and Pineapples + Doleicious Giveaway! The summer heat can be unforgiving and I found myself craving for more fresh fruits and grilled food these days. After my #DoleChefMom cooking session some weeks ago, I got more inspired to create simple dishes that will incorporate juicy pineapples. I think this new imbento recipe is worth sharing, and also a perfect dish to serve on a warm summer day. I've been experimenting with quinoa for the past couple of months now, and so far, I like cooking it with chicken and assorted vegetables. I also discovered that adding some curry powder complements the flavors of my quinoa mix. Naturally, when I received an abundance of Dole Pineapple Tidbits, juices and sauces, food ideas came to mind, and one is to add pineapple in my rice dishes. 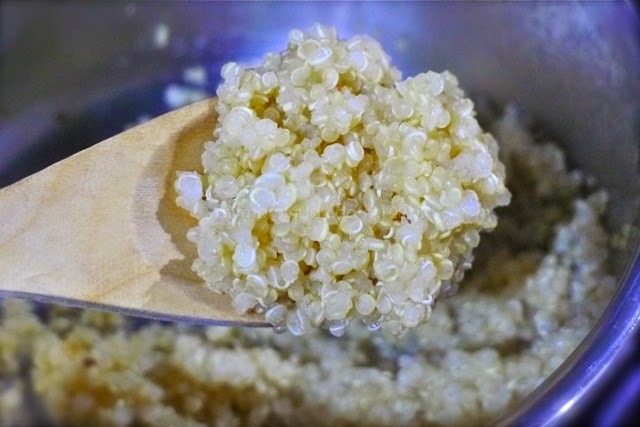 In this case, I added to my favorite quinoa recipe, which is far healthier and more nutritious than our staple steamed white rice. Pineapples can greatly enhance and sweeten a dish that even kids will love to eat. You can follow the recipes created by Chef Rosebud, which I shared here. For today's recipe, you can expect this to be light, refreshing and healthy, as you can see in the list of ingredients. I love the colors too! 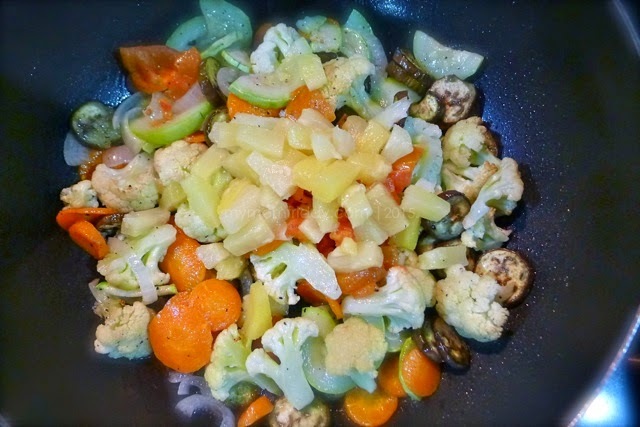 You can add and subtract the type of vegetable you want in the mix. When I made this dish and was taking photos, I realized I was missing the bell peppers! Horrors!!! Instead, I added a tomato. But I still recommend you use bell pepper for better flavor, especially after you roast it. Now, let's get cooking. 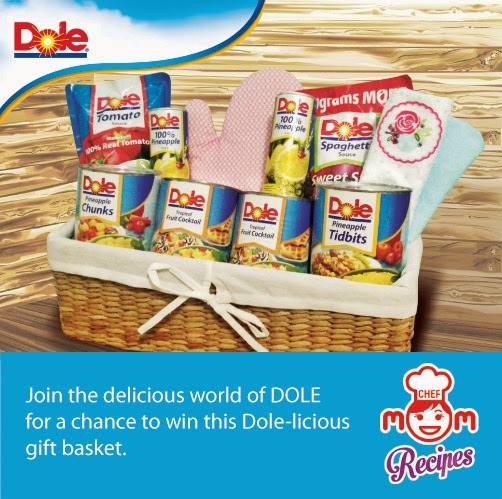 And by the way, there's a Dole-icious giveaway waiting for you at the end of this post! (",) May recipe ka na, may pa-raffle pa! 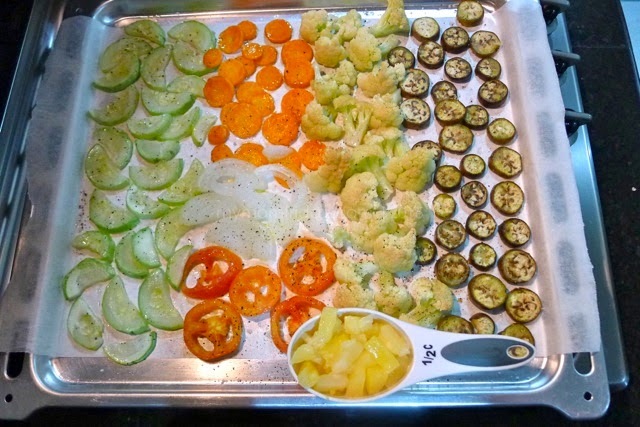 Wash, cut and slice all the vegetables. Adjust quantity of vegetables based on your preferences. Toss everything in a bowl and drizzle with olive oil, rock salt and ground pepper. 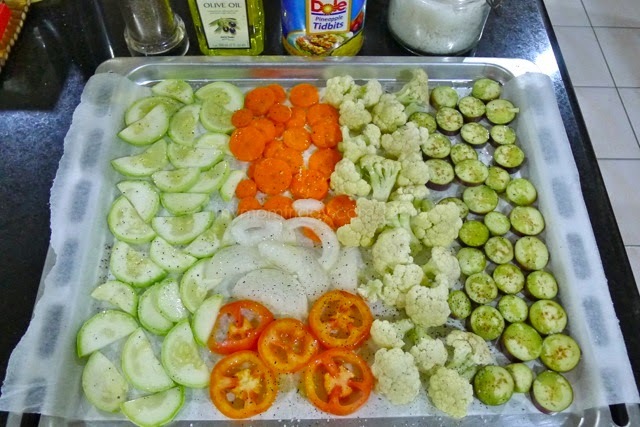 Lay all the veggies flat on a lined baking tray (see photo above). Place in the oven and cook for 20 - 25 minutes. 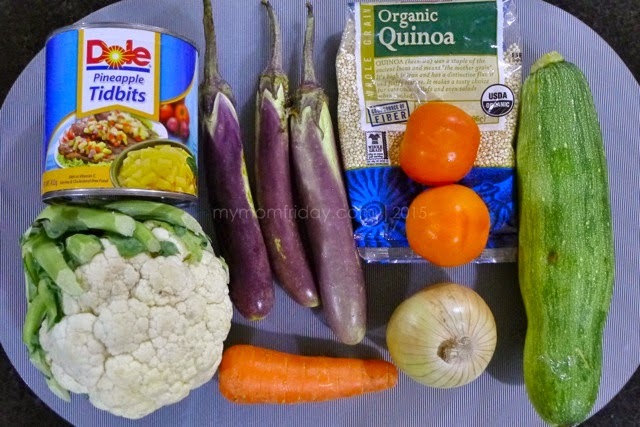 While veggies are roasting in the oven, cook quinoa in a small pot as instructed on the pack. While boiling, add a pinch of salt. Cook for about 20 minutes, until soft and fluffy (see photo above). Set aside. Take out the veggies from the oven. 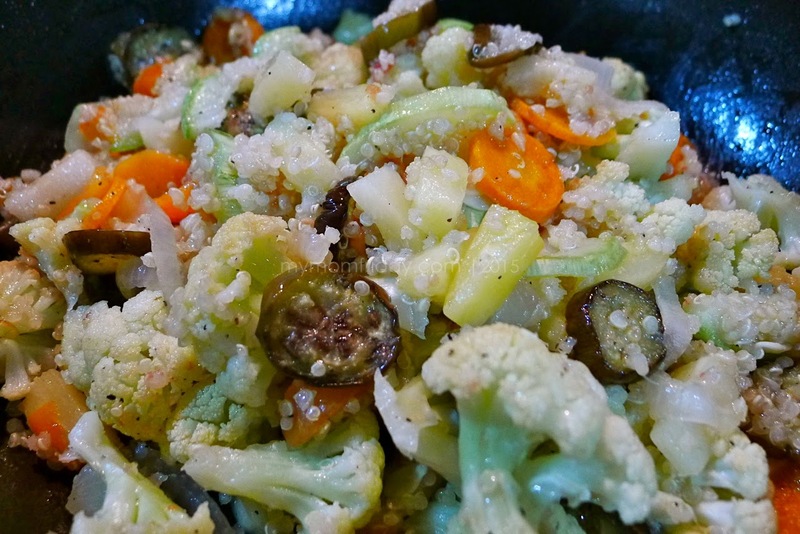 In a pan, heat a tablespoon of olive oil and toss all the roasted veggies in. Add the pineapples and pineapple juice. Mix well. 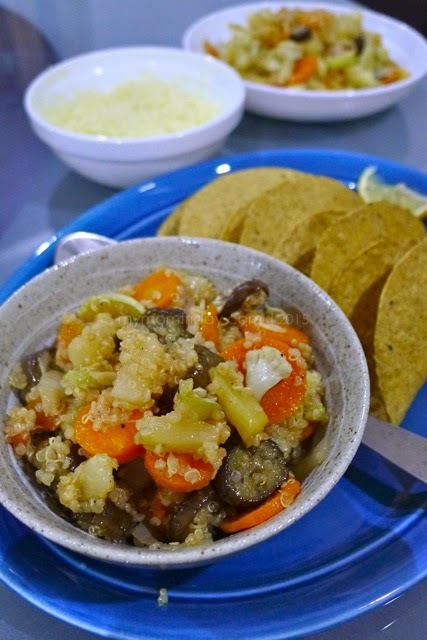 Mix everything together and make sure the quinoa and veggies absorb the pineapple juice. Add a pinch of salt and sprinkle curry powder. Taste, and add more salt or a few drops of liquid seasoning if you wish. Let the flavors marry for one to two minutes, then remove from heat. The curry flavor should be faint, very mild only. But feel free to add more. Squeeze over some lemon if you like, and serve immediately. Serves 2 - 4. After the girl picked out the cauliflower, we decided to make the leftover as taco filling, topped with grated cheese. Ta-daaa! 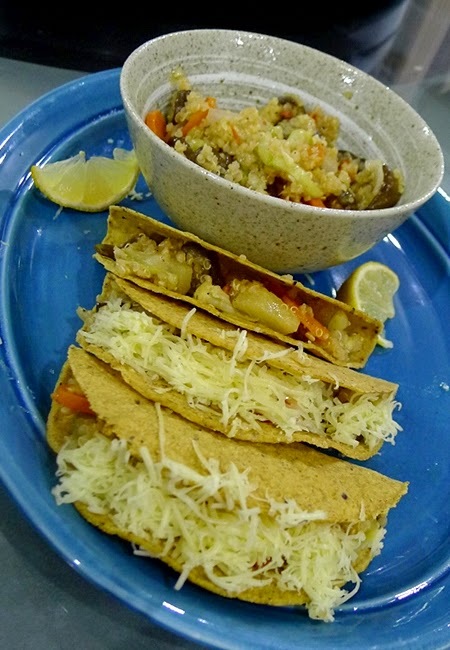 Pineapple-Veggie-Quinoa Tacos! Nom-nom-nom! As promised, I'm sharing my blessings from DOLE with this Dole-ightful and Dole-icious Blog Giveaway! JOIN NOW and share the good news to your friends!!! Like @mymomfriday on social media. Post a photo on Facebook and/or Instagram (you must do at least one to qualify), showing you are having fun in the kitchen. It can be solo with food or with others. Set to Public so I can see your post. Leave your full name, email, and your Username on FB or IG (or both) in the comment box below so I can verify your identity. Follow the Rafflecopter below so your entries can be counted. Raffle period is from May 12 - May 25, 2015 midnight. Posting on both Facebook and Instagram earns you more entries. It can be the same photo on FB and IG. You may only do this once per platform. Four (4) winners will be drawn via Rafflecopter the following week, and will be notified via email. Winners should reply to my email within one week from notification date. If no reply, another winner will be drawn. DOLE Philippines will ship the gift basket to each winner. Open to all My Mom-Friday readers with a valid Metro Manila delivery address.